Heracles battles the three-bodied giant Geryon. The hero wears a lion-skin cape and brandishes a sword. Eurytion, the fallen herdsman of Geryon, lies at his feet. The giant is depicted as a three warriors standing side-by-side, implicitly conjoined at the waist. Each of his bodies is armoured and equipped with a shield and spear. 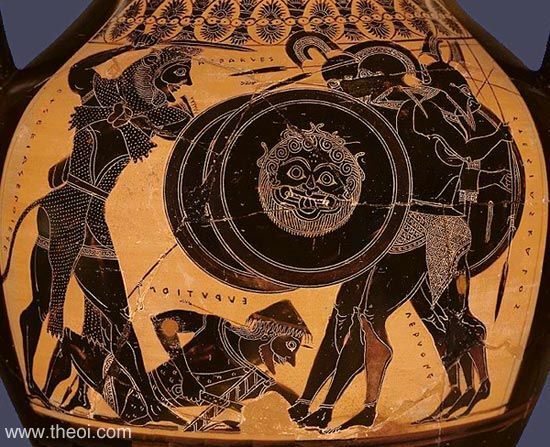 The first shield is emblazoned with a Gorgoneion--the monstrous visage of Geryon's grandmother Medusa. Detail of the Gorgoneion shield. 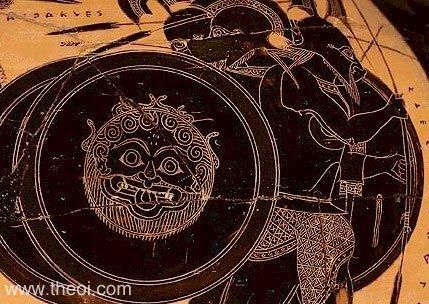 Geryon's shield is emblazoned with a Gorgoneion (Gorgon's head). The monster is depicted with a round face, wide mouth, boar's tusk, protruding tongue, bstaring eyes, a beard, and coiling serpents in its hair.